The Confederation of Service Associations of Arunachal Pradesh(CoSAAP) has suspended their non-cooperation movement scheduled from November 19 following a meeting with Arunachal Pradesh Chief Minister Pema Khnadu on Monday here. 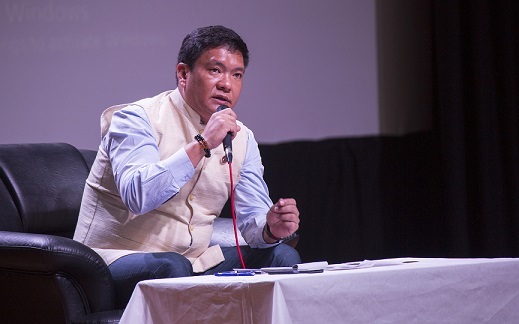 CoSAAP’s decision comes after Chief Minister Khandu assured them that the government will revoke the order of salary deduction of the employees. The Chief Minister reiterated that the State government will address the genuine demands of CoSAAP as and when the State’s internal resource position is healthy. In a threadbare discussion with members of the CoSAAP Central Executive, district units, Doctors’ Welfare Association and Directorate Officers’ Association at the CM’s conference hall here, Khandu said them that the matter relating to Tough Location Allowances and House Rent Allowances for State government employees as per 7th Central Pay Commission recommendation will be discussed in the Cabinet meeting and decision will be taken based upon the state’s internal resource position. Appreciating the hard work put in by the state government employees which has resulted in increased revenue generation and growth in almost all sectors, Khandu called for collective effort to push the State to newer heights. Stating that the unpleasant development in October was not in good taste for the people and the State, the Chief Minister asked CoSAAP to maintain restraint and avoid steps that would disturb smooth functioning of government and disrupt service delivery to the people. “Continue the good work and our government will ensure that whatever benefits the employees deserve will certainly be awarded time to time,” he said. The CoSAAP in its representation to the CM said that it lauds the commendable steps initiated by the State government. It extended gratitude for upgrading 1,535 constables to head constables in one go and also promoting many senior doctors to DMOs. The CoSAAP also thanked the CM for increasing the upper age limit for retirement from 58-60 years for all government employees. Stating that the CoSAAP has no intention whatsoever to confront with the State government and rather it is always ready to work in renewed spirit to take the State to new heights, the association requested the government to address many genuine claims, grant Tough Location Allowances, and House Rent Allowance as per the 7th CPC recommended rates as Christmas or New Year Gift.